Old and new come together in this 18-karat white gold band. To give the ring its traditional style, artisans formed the setting from classic white gold. For the contemporary elements, they added diamonds featuring various cuts such as marquise, trillion, pear, princess, and round. To increase the ring's contemporary edge, the diamonds were positioned within the white gold setting, and this causes them to sit flush against the gold. 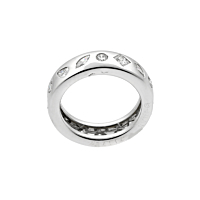 The contrasts of this white gold ring make it an incomparable piece.